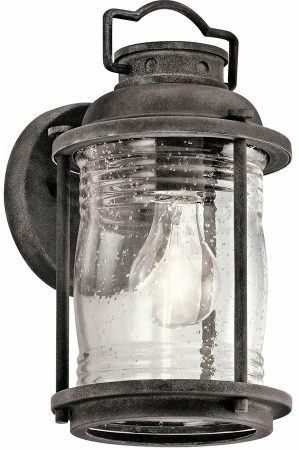 This Kichler Ashland Bay 1 light small outdoor wall lantern in weathered zinc finish with ribbed seeded glass shade is rated IP44 and features traditional period style. Boasting a circular wall mount and small downward facing lantern, with domed chimney roof and carry handle. The top and bottom sections are joined together by vertical bars and the inner contains a ribbed clear seeded glass shade. Add a little bit of colonial Charm to your outdoor lighting with the Ashland Bay collection. The traditional design is enhanced by a weathered zinc finish and clear seeded glass. Use with old-fashioned Edison style lamp bulbs for time honoured appeal. Constructed from aluminium and brass, this outdoor light will give many years of service without losing its good looks. If you are searching for quality lighting in a unique style, this small outdoor wall light should be considered. Fully weatherproof and supplied with a manufacturer’s 3-year anti corrosion warranty, which relates to the corrosion of finishes on exterior lights like this one. Locations within 5 miles of the coast are excluded. Exterior fittings must have an IP (Ingress Protection) rating which indicates the fittings ability to prevent solids and liquids penetrating the enclosure. The higher the number, the greater the protection. The minimum rating for an outside light exposed to the weather is IP23. This outdoor wall light is rated IP44. There are matching fittings in the Ashland Bay outdoor range that includes a post light, five light outdoor chandelier, flush and hanging porch lights and medium and large outdoor wall lanterns; please see below. This exterior light is supplied by Elstead Lighting and designed in the USA by Kichler who were founded in 1938. They design beautiful home lighting products featuring award-winning craftsmanship and unparalleled quality, such as the Ashland Bay 1 light small outdoor wall lantern in weathered zinc finish with ribbed seeded glass shade you see here.